When you or a loved one has spent time in a hospital, the day of discharge does not always mean that it's time to go home. Recovery from a joint replacement or other surgery, illness, or persistent wound may require expert care and special therapy that can't be easily provided at home. If your loved one has a memory disorder or other cognitive loss—whether from Alzheimer's, a traumatic brain injury or a stroke—he or she may need additional security and supervision than your home can guarantee. The Highlands at Brighton can help. 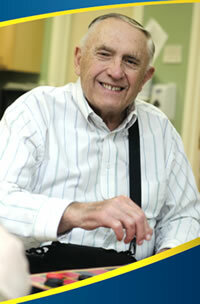 We provide transitional care for virtually any medical condition. Our comprehensive therapy will help you or your loved one transition from the hospital to home safely, restoring independence and quality of life. Here at The Highlands at Brighton, you'll find more specialty care services than at any other transitional or long-term care facility in our region. We can offer this comprehensive care because of our affiliation with UR Medicine, the region's leading provider of every kind of medical expertise. With a team of on-site medical professionals, The Highlands at Brighton brings you the medical expertise of UR Medicine. You or your loved one will benefit from our collaborative approach to all forms of medicine. Our physicians, physiatrists, dietitians, therapists and other medical professionals work together to provide you a seamless transition by maintaining your connection to your own doctors at UR Medicine. Daily 11:00 a.m to 9:00 p.m.